For a tremendous celebration of Raksha Bandhan, send this astonishing pearl rakhi to your darling brothers. 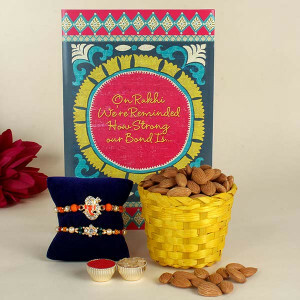 Pair it with delicious 1 Kg Rasgulla and 500 gm Kaju Katli for brothers to sweeten the bond. Astonish your sweetheart brothers this Raksha Bandhan with this dazzling Rakhi combo which they will surely be devoted to. 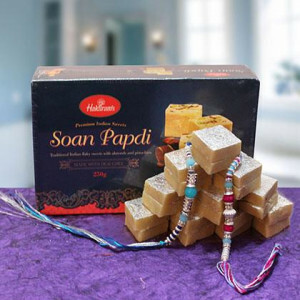 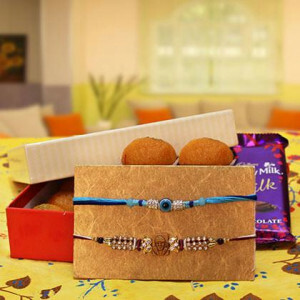 Send this rakhi duo to your brothers along with 500gm Kaju Katli. Celebrate the wonderful bond you share with your darling brothers by gifting this sweet and magnificent combo. 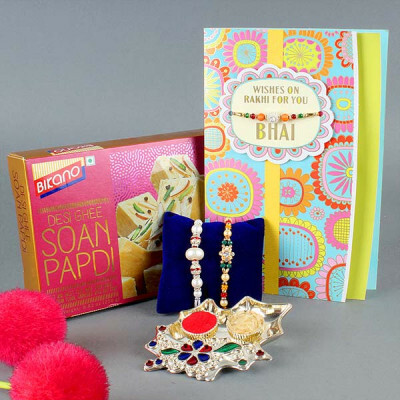 It consists of a rakhi duet and a box of 1 kg Gulab Jamun. 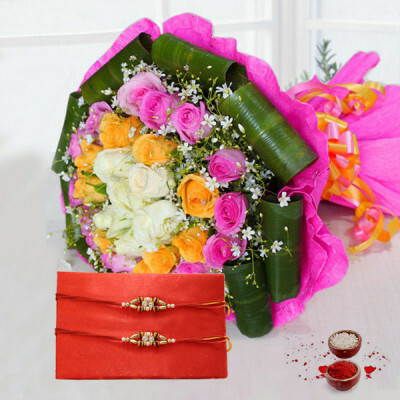 Roses make the special occasion more memorable. 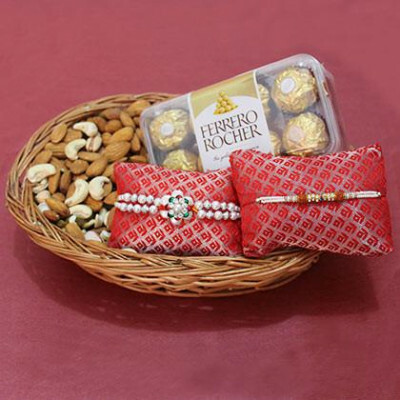 Thus, send this Stunning Handpicked Basket arrangement on this Raksha Bandhan that consists of 15 Red Roses and Rakhi roli and Chawal, it just sets everything perfect. Gift this Rakhi combo to your elegant brothers who like to stay it stylish. 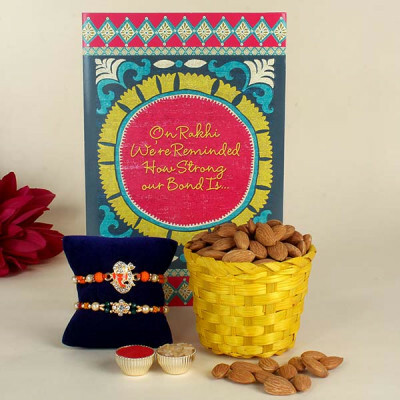 It consists of a set of 2 trendy rakhis having Kundan work, a greeting card, and a basket filled with 100gm almonds. 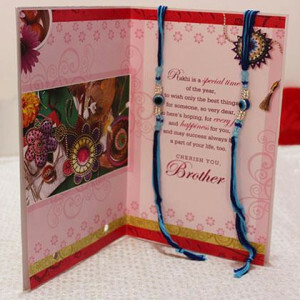 A brother is the merely one who stands next to his sister when she is in difficulty. 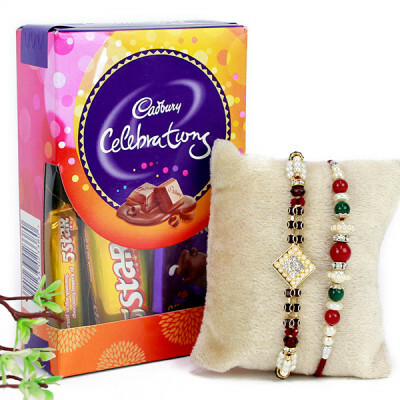 Sisters in return concern for his small things, pray for his long life and astonish him with gift hampers. 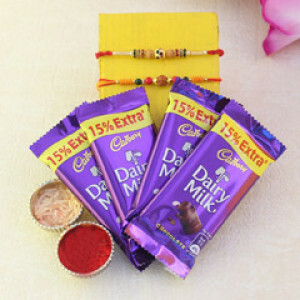 Thus, make this eve a great celebration by this combo that consists of 2 Rakhi with 8 Red Roses Bunch and 1 Kg Gulab Jamun.